A while back, I was searching for a basic vanilla cupcake recipe and came across a great cooking and baking blog, Brown Eyed Baker. 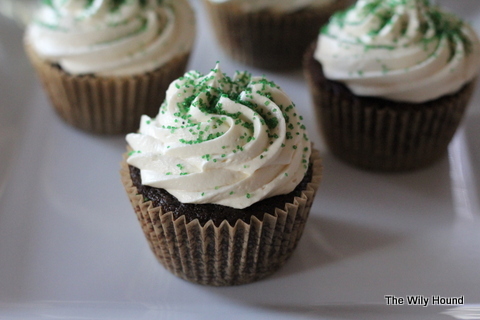 The author of the blog, Michelle, has a ton of different and unique recipes and one that stood out for me was a cupcake recipe that seemed perfect for St. Patrick’s Day – the Irish Car Bomb Cupcake. I bookmarked those bad boys and finally had the chance to make them this past weekend. 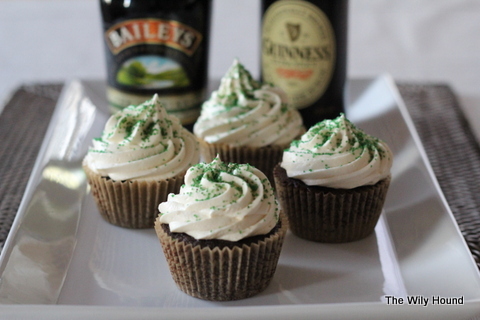 The cupcakes get their name from a popular drink that includes Guinness, Jameson whiskey, and Bailey’s Irish Cream. The cupcakes are made with Guinness, they are filled with a ganache made from Jameson, and then they are frosted with a Bailey’s-flavored frosting. I was running short on time and whiskey, so I omitted the ganache and they were still winners. 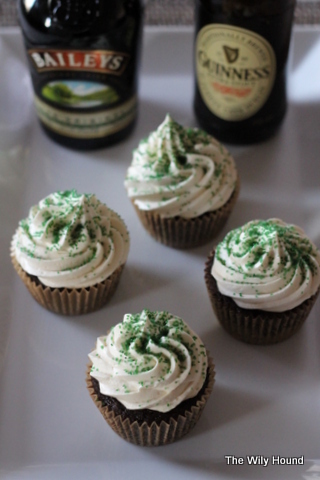 The cupcakes came out great – they are dense (but not in a bad way) and fudgy and the Guinness gives them a nice extra kick. The frosting was kind of the star of the show this time around; I followed the directions in the recipe and whipped the butter for a few minutes before adding in the rest of the ingredients and it resulted in a light and fluffy frosting that will knock your socks off. I’ll probably be using that technique for my buttercream frosting from here on out; it’s a nice alternative to the traditional heavy buttercream that we all know and love. I hope it wasn’t just the Bailey’s talking, but Justin gave the cupcakes an unheard-of 4 Seals of Approval. Preheat oven to 350 degrees F. Line 24 cupcake cups with liners. Bring the Guinness and butter to a simmer in a heavy, medium saucepan over medium heat. Add the cocoa powder and whisk until the mixture is smooth. Cool slightly. Whisk the flour, sugar, baking soda and salt in a large bowl to combine. Using an electric mixer, beat the eggs and sour cream on medium speed until combined. Add the Guinness-chocolate mixture to the egg mixture and beat just to combine. Reduce the speed to low, add the flour mixture and beat briefly. Using a rubber spatula, fold the batter until completely combined. Divide the batter among the cupcake liners. Bake until a thin knife inserted into the center comes out clean, about 17 minutes. Cool the cupcakes on a rack. Using the whisk attachment of a stand mixer, whip the butter on medium-high speed for 5 minutes, scraping the sides of the bowl occasionally. Reduce the speed to medium-low and gradually add the powdered sugar until all of it is incorporated. Add the Baileys, increase the speed to medium-high and whip for another 2 to 3 minutes, until it is light and fluffy. Using your favorite decorating tip, or an offset spatula, frost the cupcakes and decorate with sprinkles, if desired. Store the cupcakes in an airtight container. Yum! I made similar cupcakes before and they didn’t turn out so great, looks like I should try again! I could eat ten of these right now!! Thanks for linking up! Booze and cupcakes?! I think my husband may fall in love with me all over again if I make these for him. Thanks for the recipe!